Finally a real adrenaline pumping chase day! The plan was to find the dryline intersection with the outflow boundary from the previous day’s storms and wait. We drove from Hobbs, NM to Big Spring, TX and had lunch, which was an adventure in and of itself: The Pizza Hut was partially close because it had been flooded out, but this biker standing nearby recommended the “Best Mexican food in Texas” at the Spanish Inn, talked it up said his brother or some other relative ran it, was going to call ahead, etc. etc. So we went over there and it was closed!... and by the look of it, we’re probably lucky it was! We went to Pizza Inn. By the time we’d finished up lunch, a line of storms was firing to our northwest near Seminole, so we headed out of town to intercept the best looking cell with the plan being to chase that cell, then as storms fired down the line drop to the tail end storm, repeat, and repeat again. We didn’t have long before we intercepted the first storm as it went severe and was soon tornado warned near Patricia around 3 PM. We stopped and observed a big wall cloud low to the ground and within a minute or two there was a persistent dirt swirl on the ground with cascading motion above, tornado number one for the day! That tornado lasted only a minute or two, and the storm was right turning hard so we had to get ready to leave. We observed the rear flank downdraft winds plowing dirt into the sky and had to beat feet to get out of the way, running south down Rt. 137 towards Lenorah. We got plastered by flying dirt and strong cross winds as we blasted south, and a large spin up (probably a gustnado but can’t rule out a shearline tornado) formed just west of my van as we headed away. The storm had quickly become a high-precipitation monster, making visibility into the notch area very difficult, and by now the chaser hordes had arrived, hundreds and hundreds of vehicles worth. This was by far the most difficult portion of the day, finding ways to safely navigate all of the traffic pulling in and out of every decent viewing position while trying to keep our four vehicles together. By 4 PM, the storm was totally HP and any tornado that was in there was completely rain wrapped (in fact there were reports of a rain wrapped tornado crossing I-20 near Coahoma later), so we decided to drop to the next storm in line which was now becoming quite severe. We passed through Big Spring again and headed west on I-20 to intercept. 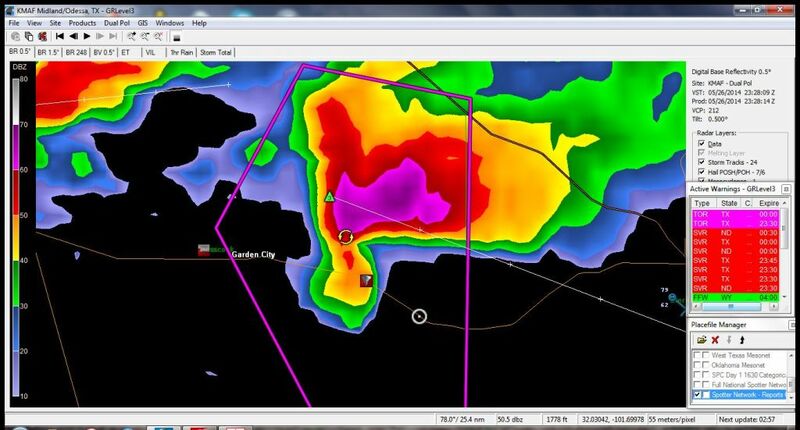 At this point the storm had a tremendous radar return with a “scorpion tail” hook echo on radar indicating rapid rotation. As we charged towards the storm, we couldn’t see the updraft through the massive precipitation core that was racing towards the highway with baseball sized hail, so we got off the highway and headed south on Rt. 33 to get around the core and beat the storm to Garden City. We stopped for a minute to view the storm and had a neat vantage with our new storm our west, and our old storm chugging away to the northeast. We immediately saw another big dirt bob in the distance to our west but concluded that this was again RFD winds plowing around the south side of the storm. We continued south, now once again swamped in the convoy of chasers that had finally abandoned the northern storm. We leapfrogged through the chaser-gaggle, heading east on rt. 158 at Garden City as the storm grew to peak intensity, with 3-4” hail and a massive hook echo still on radar. It was also getting HP quickly and ingesting an incredible amount of dirt from the dry fields in the area so it was getting difficult to see into the inflow notch. We finally got ourselves way out ahead of the storm and found a south pull off to set up and watch as the storm came right down the highway after us. The storm now had a big wall cloud and was rotating like crazy. We stayed at that location for about 15 minutes as the storm closed in quickly, with RFD dirt plumes, gustnadoes, and all kinds of flying dirt in the air. Soon it was time to get out of the way, so we headed back to the end of the road when Roger started yelling to stop and sure enough, to our west there was a weak tornado occurring, wrapped up in rain. We waited very briefly as it closed on us and seemed to dissipate, then everyone in my van starting yelling and I turned to see a tornado forming less than 100 yards from the van! We hit the gas and got out of there as the tornado blasted through the field south of us then quickly dissipated. Our next issue was that we were now getting into the Mosquite region of Texas, with lots of trees and big ridges on either side of the road so it was difficult to see. There were a variety of reports of a rain wrapped tornado, so we stayed well ahead of the storm. At one point we stopped for a few minutes and may have gotten a look at a small cone tornado off the distance but can’t confirm. After a brief stop south on 163 south of Sterling City, we headed down Rt. 87 southeast towards Water Valley. On the way we were able to see a short duration rope tornado coming from the storm, though I didn’t see it as I had to keep my eyes on the road (the downside of driving on chase days sometimes). Northwest of Water Valley we stopped at a rest area, turned the vans around, and waited for the beast of a supercell to come right to us. The structure was incredible! The storm had little tornado potential by now but was packing huge hail. We watched for about 30 minutes as the storm came to us and passed just to the north. Meanwhile, right behind that storm was another tornado warned storm, so once our previous storm moved out of the way we headed back up Rt. 87 to take a look, but at this point it was getting dark and the storm seemed to be getting seeded by the water cooled air blowing out of our previous storm, so we decided to call it a day and head into San Angelo for dinner. We did have a little moment of excitement there as just as we finished eating dinner it became obvious that if we didn’t get clear in about 10 minutes, the storm we’d left was about to pummel the town (and us) with tennis ball hail! We scrambled to get in the vans and blasted northeast of town, just getting clipped by the edge of the core as we got away. The rest of the right up to Abilene was uneventful. Fantastic chase day with 2 great storms, 3 brief tornadoes (and maybe glimpses of 2 more) and not that much driving: only 460 miles. The one day on the trip with real tornado potential! We headed east from Hobbs, then to Big Spring, TX, before intercepting a tornado warned storm near Patricia, TX. Moments after we got into position, a persistent dust swirl appeared under a rotating part of the storm with cascading motion. Tornado! The storm was moving fast and turning right hard, so pretty soon we had to get ready to run! The hail core coming down the road we're on from the west. There was all kinds of crazy motion under this raggedy wall cloud. Meanwhile the hail core kept getting closer. We moved down the road as the storm became a big HP hailer. Big inflow band getting sucked into the storm. OK, time to go again! But we waited too long to keep out of the RFD... After our escape near Lenorah, we headed down I-20 to intercept the next storm down the line. But first, a look back at our original storm to the northeast. Meanwhile, here's the new storm to our west as we headed south to beat it to Garden City. Not long after we stopped we observed a large dirt bob on the ground, but concluded it was dirt blasted up by RFD coming around the south side of the storm. 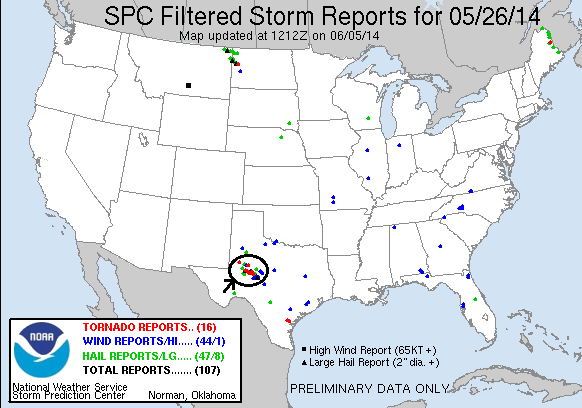 The storm intensified very quickly and was reported to have 3-4" hail. East of Garden City the storm became a monster HP supercell. Raggedy wall cloud to our south spinning like crazy. 3 layers: the updraft, inflow band, and a tail cloud. The core approaches from the northwest, awesome structure! Big wall cloud develops under the base. The wall cloud quickly gets ragged however as the storm closes on our position. The storm now just to our north. with a massive inflow band and tail cloud. Closeup of the tail cloud. Another big wall cloud develops as the updraft gets almost right on top of us. The guests enjoying the view! RFD blasting up dirt just to our west. The mesocyclone just to our northwest, with RFD whipping around the south side. Funnel forms under the wall cloud, but quickly dissipates. Wider view of the storm structure with the funnel on the right side of the base. The inflow band looks like it's pulling in air right from the ground! As we prepare to head east on Rt. 158, a tornado forms just west of us! Nub funnel with persistent rotation on the ground below it. Wider view for the overall structure. Rain curtains wrap around the tornado in the field just west of us. We continued down Rt. 158 with the hook echo of the storm following right behind us! We ended up in Mesquite country where the road traveled down a valley with ridges on either side, making it hard to track the storm. I was expecting to see a tornado come over the hill at any time! Possible tornado in the distance to the right of the telephone pole, but it was too far away to tell. Another shot, now to the left of the telephone pole. A tornado was reported on the storm at this time. Wide view with the storm coming over the ridge at us. If there is a tornado, it's just to the right of the telephone pole in this shot. We continued through Sterling City and headed south with a big wind farm in the foreground of the now long line of storms. We stopped at a rest area northwest of Water Valley and let the storm come to us. Fantastic striations! Getting closer. Striations and a long inflow band feeding the storm from the southeast. Better look at the inflow band. As the storm gets closer you can see the ground dragging wall cloud under the storm! The storm with the SLT fleet in the foreground. Better look at the wall cloud as it passed to our west. The storm gusts out blowing out this shelf cloud just to our west.